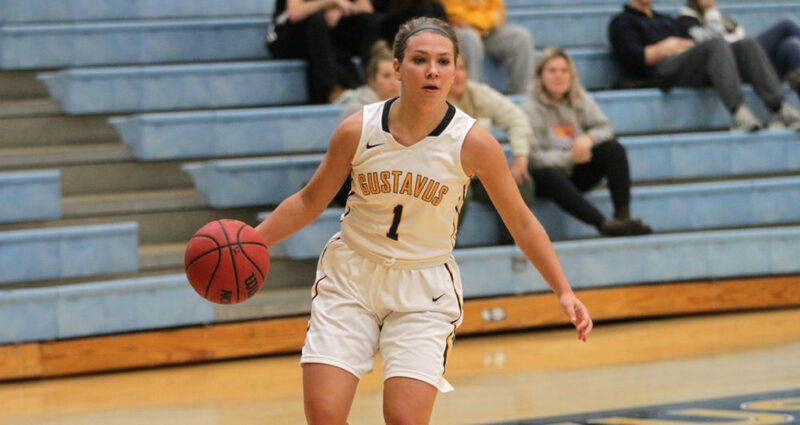 DECORAH, Iowa – The Gustavus women’s basketball team lost a non-conference game at Luther 71-64 on Saturday afternoon. The loss snaps a three-game win streak as the Gusties drop to 3-2 overall. Gustavus was limited to 32.8 percent shooting from the floor (20-61) and was unable to crawl out of a 12-point hole at halftime. The Gusties scored the first two points of the game but that would be their only lead as the Norse went on an 18-1 run over the next six minutes. Luther led 37-25 at halftime and increased its lead to as much as 17 points (51-34) with 4:39 remaining in the third quarter. Gustavus would not go quietly though, answering with a 15-3 run to bring the score to 54-49 with a minute left in the quarter. The visitors continued to battle back and made it a one-point game (62-61) on a three-pointer by Alison Hinck (So., White Bear Lake, Minn.) with 3:11 left in the game, but the Norse responded with five straight points and were able to hold on to the lead for the win. Kendall Thompson (Sr., Eden Prairie, Minn.) led the Gusties with 15 points on 6-of-18 shooting. Ava Gonsorowski (So., Esko, Minn.) and Justine Lee (Sr., Dawson, Minn.) also reached double figures with 11 and 10 points, respectively. Gustavus returns to the hardwood next Thursday night at UW-La Crosse.